CQhost WebHosting | Free domain name reservation and parking. Reserve your domain name today! Reserve a Domain Name in 30 seconds! With more than 200,000 domain names disappearing every month, you need to act quickly to secure your domain name. Register your domain name now (.com, .net, .org, .biz, .info, .us, .eu), before it's gone. DNS server until you get your own site. 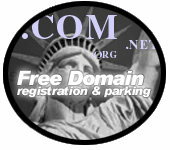 CQhost does not charge you for its Domain Parking service. You will be billed by the registrar/Internic as low as $14.95 / year registration fee that covers your new domain name registration (instead of $35). Worldwide web hosting services Copyright � 2013 CQhost.